UnionTech launched its PILOT commercial series at the TCT Show in Birmingham, UK, September 26-28, and RP America is pleased to be the first distributor to offer this new line of equipment to the North American market. The PILOT product line is targeted for additive manufacturers looking for high-quality equipment with excellent surface aesthetics, application range, and ease of use—at an affordable price. Stereolithography (SL) technology - the most accurate and versatile additive manufacturing technology. SL can produce fit and function prototypes, investment casting patterns, and even end-use parts. Shanghai Union Technology Corporation (hereinafter referred to as “UnionTech”) launched its PILOT commercial series at the TCT Show in Birmingham, UK, September 26-28. The PILOT product line is targeted for additive manufacturers looking for high-quality equipment with excellent surface aesthetics, application range, and ease of use—at an affordable price. 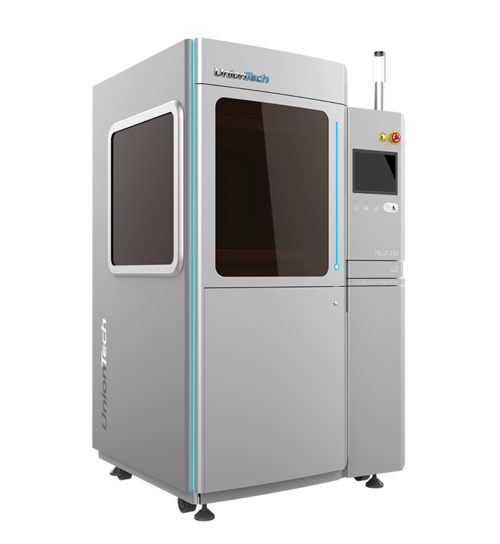 Since its pioneering entry into the 3D-printing market in China in 2000, UnionTech stereolithography (SL) equipment has evolved in a highly competitive environment consisting of direct technology competitors as well as significant cost pressure from a well-entrenched CNC machining industry. Such competition has resulted in UnionTech’s product offerings, which are robust with low maintenance requirements, produce highly accurate parts, and are cost-effective throughout their lifecycle. Since a 2016 expansion to international markets, UnionTech has identified a large segment of 3D-printing users who would benefit from the versatile capabilities of stereolithography but are limited to other technology choices due to cost. This unmet need in the marketplace has led UnionTech to develop the PILOT series—specifically targeted for users who want the benefits from the excellent surface aesthetics, application range, and ease of use of today’s SL technology with a product series deliberately priced for affordability and value. The PILOT 250 features a 250 mm x 250 mm x 250 mm platform, while the PILOT 450 series offers a 450 mm x 450 mm x 400 mm build platform. The PILOT series features open design for materials and build preparation software and has all the “industrial strength” capabilities of UnionTech’s RSPro production series (RSPro 600 and RSPro 800). Typical features include scan speeds up to 12 m/s, layer thicknesses as low as .05 mm, and accuracy of +/- .1% over part length. Similar to the RSPro production series, the PILOT series of SL equipment features key components from globally recognized suppliers including Spectra-Physics, Advanced Optowave, SCANLAB, and Panasonic. Robust construction details include a granite recoater frame, closed loop control of key operating parameters, pump-fed refill capability, and a high-efficiency vacuum re-coating system. The SL process is capable of directly producing prototypes across a broad spectrum of properties, including toughness, temperature resistance, and strength and stiffness for fit and function evaluations. There are broader ranges of stereolithography applications that include prototype tooling for injection molding, patterns for investment casting to create near-net shape metal parts, and metal-plated composites capable of die-cast metal properties that can be developed with a single piece of equipment. Today, with the affordable UnionTech PILOT series available in the marketplace, 3D-printing users can produce a wider range of applications with a solid combination of “21st century” material and printer capabilities. UnionTech equipment is robustly constructed for low cost of ownership from the initial purchase onward while producing the highest quality parts. Parts produced on UnionTech SL equipment are highly accurate with excellent feature resolution and full density, smooth surfaces. A philosophy of open design relative to material usage demonstrates UnionTech’s desire to provide customers with the best available product solutions. Explore the fresh dimension in SL 3D printing that UnionTech makes available in a full line of commercial and production scale machines.